This is a guest post from my brother Marc who spent some time in Bellevue, Ohio with his family this summer. 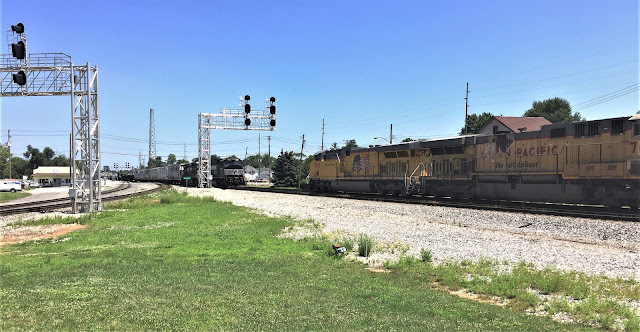 He was lucky enough to catch a cool meeting of freight trains on one of the Norfolk Southern lines through town. Summer family vacation brought us to Cedar Point, in Sandsuky, Ohio. It’s one of the largest amusement parks in the USA, and highly recommended for those that seek thrills. It also allowed my son and I to check out some trains, old and new. Cedar Point is directly South of Point Pelee, Ontario, on Lake Erie. The park is quite large, and in has a historic railroad to ferry guests around the park. 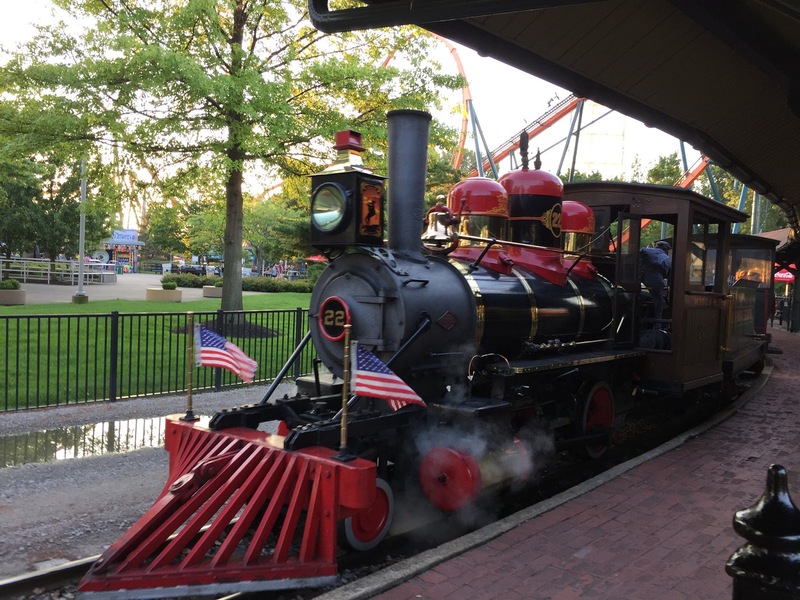 There are five steam powered locomotives that pull open carriages on a two-mile loop. I was surprised to see the fireman shoveling coal in the tender. I would have guessed the locomotives would have been converted to another fuel. No 22 was our power, saved from work in a coal mine. Built in 1922 by Vulcan Iron Works, this narrow gauge engine made fantastic sounds. In 50+ years, the line has moved more than 2 million guests, meandering through ponds and under roller coasters. 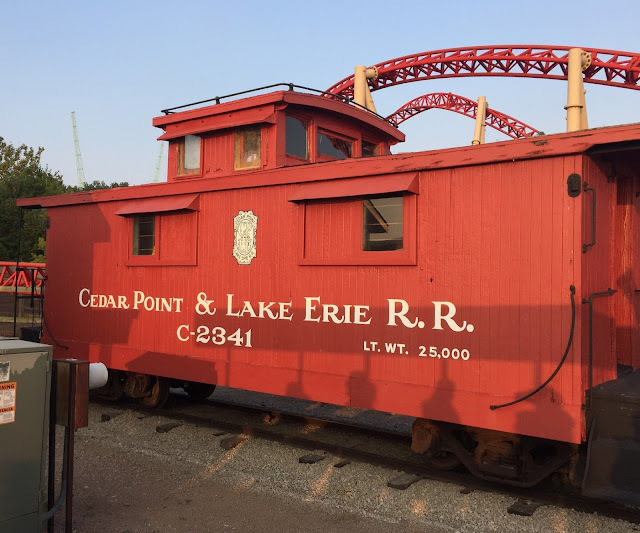 This wooden caboose is a static display, adding a backdrop for the “Cedar Point and Lake Erie RR” The old caboose with roller coaster as a backdrop makes for a neat contrast. A standard practice for our family vacations is to check the route home, for anything train-related that may interest my son. 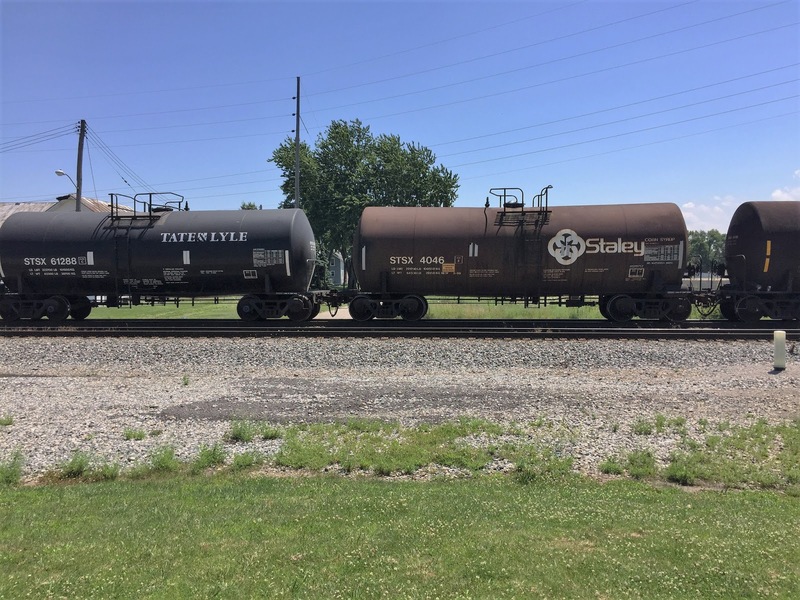 Bellevue, Ohio is a small town South of Sandusky, and is home to a massive Norfolk Southern yard. It is billed as the second biggest rail yard in North America and is the railway's largest. I couldn’t catch a good shot of it, hustling down the busy highway. Bellevue houses the largest rail museum in Ohio, the Mad River Rail Museum. That visit deserves its own post. While visiting there, we wanted take a break for a picnic lunch. Our friendly museum host recommended a viewing platform a few streets over, along the main Norfolk Southern line. What a treat, I wish more towns had these convenient areas for sitting trackside. We didn’t have to wait long to see some action. This NS train stopped short of us, waiting for clearance. In the distance, we could hear another train approaching. My son was delighted, as he had never seen a NS engine before. But there were more surprises. 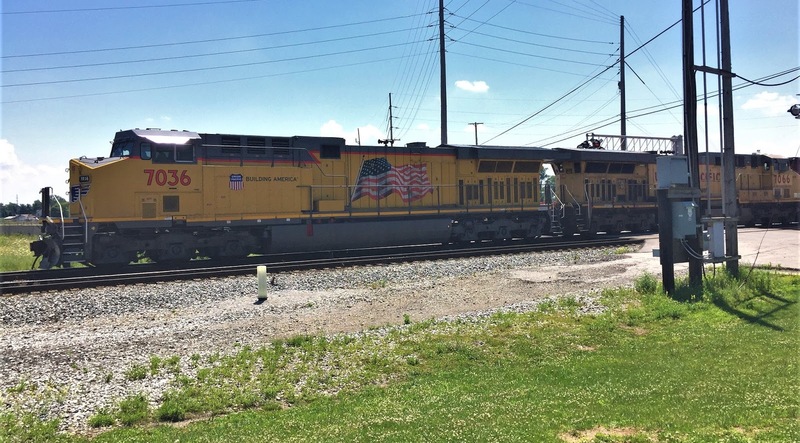 A UP-led freight and a NS freight meeting up may be common for some, but it was all new for my son and me. A neat sight to cap off our trip home. The UP-led train was a mixed freight with auto racks, hoppers, and many small tank cars that I don’t normally see in SW Ontario. Belleview is worth a stop if you are in the area. It’s a picturesque small town, reminding me of a historic movie set. The Mad River museum is outstanding, and I look forward to giving a quick tour here in the future. With my last post about my weekend of railfanning in London in August, I wanted to share some photos of a long freight train I caught up with in CN's London East Yard. I was on Egerton Road, a city street that literally crosses the entire rail yard (six tracks at this crossing, if you can believe it). I noticed from a signal that a train was making its way from the west so I decided to head back a few tracks and get a few wide shots of the slow moving consist. I tried to frame the train around the excavator in the middle of the yard at first. Here's a better attempt at incorporating the construction equipment with the train. As I have mentioned throughout this year, I really feel as though my rail photography has improved this year, since I have paid better attention to details like these construction vehicles that are trackside. The results aren't always there, but I was happy with this shot below. After a few shots with the construction equipment, I pulled the lens back to try and get a wide shot of the train. I was intrigued that a single autorack would be the buffer car between the two lead units and the tank car behind it. I don't often see autoracks leading a mixed freight consist, but readers have assured me before that it does happen. I also tried to keep an eye peeled for some interesting rolling stock. Sadly, this train didn't have a lot to offer, but I did manage to catch this old RailGon gondola, which is now patched DJTX. I recall seeing a better shot of this type of gondola in another blog recently. The logo is barely visible in this shot, but I'm glad I got the shot nonetheless. I love seeing these carbon black hoppers, since they remind me of the old Cabot Carbon fleet that once graced the St. Clair River Industrial Spur in the Chemical Valley in Sarnia when I was younger. At some point, the cars lost the Cabot logo, which was usually stenciled top right. This shot shows you the train making its way through the yard. As the train made its way past Egerton Road, I noticed it was crawling to a stop. I took a few shots of the train going away and scrambled back to the Highbury overpass (you can see it just beyond the front of the train. Also, can you see the yard geep in the right of the image?). As I made my way up the overpass sidewalk, the lead units were uncoupling from the train, although the autorack and tank car were kept in tow. I tried to get a shot of the train alongside three of the yard units. The wires frustrated my efforts, but I thought I'd share this shot anyway. Here's a closer shot of the two lead units making their way toward the overpass. I tried to capture the two workers in this shot, but I couldn't work around the one wire. The two units made their way under the bridge, which allowed me to get these overhead shots of the vents, although the afternoon light washed out a few of my shots. Yeesh. I shuffled around a bit and tried to mitigate the effects of the sun. I was pretty happy with this shot. So, that concludes my five part series based on a single weekend in London. It was a great weekend for me and a lot of fun. Next week's post will bring me back to Ottawa. Lots going on here with the O-Train Confederation Line. Lots to talk about. Stay tuned. When I mentioned that August was a record month for me, I wasn't kidding. My visit to London alone yielded more railfanning than I have ever done in a weekend. The highlight of the weekend, at least from a photograph standpoint, came when I caught this container train from the Highbury overpass over the London East Yard. It started when I was passing over the Highbury overpass and saw the signal lights for eastbound traffic flashing green. I knew that meant that something was on its way. So I turned my car around and headed for a nearby parking lot, which allowed me to scamper up the overpass sidewalk and position myself for some great shots. In a few seconds, a container train with two locomotives rumbled around the curve near the Western Fairgrounds and hit the straightaway. I initially set myself up almost straight on (see above), so I could get a shot of the train and the train yard in the same shot. But I quickly shifted to my left so I could get a little more of a profile of the train. I was pretty happy with the above shot, since it pretty much confirmed to me that everything came together. Perfect lighting, perfect positioning (no shadow) and great framing. I won't pat myself on the back too much. I know my limitations as a photographer. But when I saw this shot of 5487 and 2635 pulling a long string of containers, I knew I had a special shot. I did a quick zoom and got a close up of the lead units. You can see the exhaust in this shot. Always a plus for me. I zoomed out a little and got a shot of the train itself with some of the London skyline in the background. You can see this train snaking around the curve in the top of the photo. I was waiting for traffic on Highbury to lighten up a little so I could cross to the other sidewalk and get a going away shot of the train, especially since the other side had some interesting features for a rail photo. I really like this shot of the containers heading under the gantry as the train heads east toward Toronto. One final going away shot, although by this time the sun was washing out the sky to the extent that I couldn't colour correct it in a way that still did the rest of the photo justice, so I left the shot unfiltered. This was the first CN container train I have shot since I ran across two container trains in Markham in 2013. Yep, it's been that long. I will concede that these trains hardly thrill most railfans and I am no exception. However, when you get an overhead shot and the light and positioning are just perfect...well, it's a satisfying meet for sure. I have one last item to share from my time in London, which I will save for the next post. Actually, I have two items, but one of them will be saved for a more thematic post later this year or next. I think a six-part series about London might be overkill. As I continue to sort through my epic weekend in London and all the railfanning I was able to do, I think my CP highlight was being able to watch this local getting its consist together before making its rounds. As I mentioned in my last post, taking photos on the Quebec Street overpass does afford you a great view of the railyard, but the electrical wires are a visual hazard that you either have to work around and put up with in your shots. I was happy I stuck with it because this local featured a couple interesting aspects that were worth the hassle with the wires. This first shot was taken in between the wires. You can see that two geeps are pulling some pretty sizeable boxcars, a few lumber cars, a string of covered hoppers and two more lumber cars. Given the back and forth that was being done, I believe there was some shuffling of the order of this train being done, although I didn't stick around for the full show. You can see the conductor in this shot. As the train came closer, being led by CP 4426, the wires became a visual hazard that I could not overcome, but I couldn't resist sharing this shot of the two geeps kicking up a little smoke. You will recall that I got quite a smoke show from a couple of old CN GP9s in Sarnia in this post. As I mentioned then, you don't see many of these type of action shots. I'm not sure why. I love shots with lots of smoke. Thankfully, the other side of the overpass was distraction free, so I was able to get some shots of the local (and CP 3043 with the golden rodent logo) heading out of the yard. The industrial backdrop was a bonus, although it didn't seem as though any of those businesses were rail served. Since the train was moving slowly, I was able to get some shots of the rolling stock, including this old boxcar, which still has the old CP Rail script, although without the old logo. I was intrigued by the old script, which looked like it was somehow modified or corrected at one point, although the paint appears to be chipping away. Here's a long shot of much of the consist. I like this shot because it illustrates something I don't often see. There were four tracks leading out of this railyard. Most railyards I have seen usually narrow to a single or double track at the end of the yard limits. This four-track expanse looks like a throwback to me. It's not necessarily the NYC Big Four mind you, but you get the idea. You may wonder about the title of this post. Well, when I saw this line of crisp new Canada Malting Co. hoppers, it made me think of the Labatt Brewery in London. I checked out the brewery on Google and it doesn't seem as though there are any tracks serving this plant, although there is a nearby railyard. It made me wonder if any of the products for Labatt are brought by rail. Not being an expert on this city or its rail operations, I will leave it to a more informed reader to let me know. Here's a closer shot of the company logo on another hopper, although this one is already showing the first signs of being tagged. I should mention that this was the first time I have seen this company's cars. As I have mentioned this year, it always pays to take a quick shot of the rolling stock on a train. I hope you're not getting too tired of the shots from Southern Ontario, because I have two more posts from London before I turn my attention back to other locales, including Ottawa. I am going back to Southern Ontario to visit family for the Thanksgiving weekend, so I might have more to share from this region in the weeks to come.